L.A. 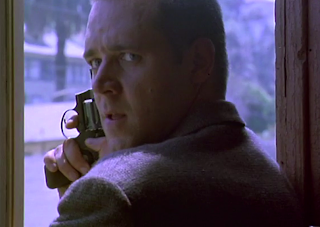 Confidential is a near-perfect masterpiece that has only improved since its 1997 release. It deserves to be named alongside Chinatown (1974) as one of the definitive explorations of the seedy underbelly of Hollywood’s Golden Age, but I actually prefer L.A. Confidential to Chinatown. While Chinatown ends with a wildly cynical and hopeless statement about human nature, L.A. Confidential travels through the darkness and into the light. It takes all the trademarks of the film noir genre and spins them into elegance, somehow making them seem fresh again. Detectives, booze, broads, murder, intrigue; it’s all here, and it’s never been better. The film opens with Danny DeVito’s character praising Los Angeles as the perfect city: a magical 1950’s ideal, without any problems. After a minute or so, he reverses direction, saying, “At least that’s what they tell ya, ‘cause they’re selling an image.” The three main characters are cops working for the Los Angeles Police Department in the early 1950’s, and they’re all in it for different reasons. Edmund Exley (Guy Pierce) is a cold, clean-cut guy who adheres to the rules, Jack Vincennes (Kevin Spacey) loves the spotlight, and Bud White (Russell Crowe) administers justice in his own way. After a brutal shooting takes place at the Nite Owl coffee shop, dubbed “The Nite Owl Massacre,” the three cops find themselves unraveling a mystery with shocking implications. The cast actually looks stronger now than it did at the time. In a cast of veteran actors, the two fresh faces were Guy Pierce and Russell Crowe. Guy Pierce later starred in Christopher Nolan’s Memento (2000), and Russell Crowe went on to win an Oscar for Gladiator (2000). The cast also includes James Cromwell, David Strathairn, Danny DeVito, Kevin Spacey, and Kim Bassinger, who actually won her Oscar for her performance in L.A. Confidential. There were actually concerns at the time that the principal cast didn’t have enough big names, which now sounds like a joke. Casts sometimes suffocate under the weight of too many powerful cooks in the kitchen, but thanks to a great script, this kitchen was big enough for all of them. 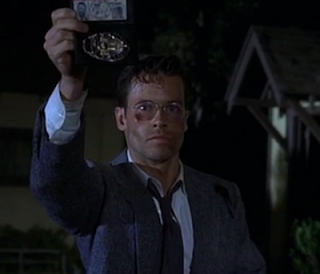 L.A. Confidential’s Academy Award-winning screenplay is extraordinary. Adapted from an epic crime novel of the same name by James Ellroy, the script packs so many plot elements that it could have easily left its audience behind. Compared to the book, however, the film looks simple. In adapting the screenplay, Director Curtis Hanson had to boil the book down to its basic elements, cut some of those out, condense the characters, eliminate entire plot threads, and somehow have it all make sense. Most astounding of all, the labyrinthine plot unfolds logically while taking a backseat to character development. Few noir films care so much about their characters. I’ve probably seen this film a dozen times or so, and I still can’t fully grasp the brilliant tightness of the writing. To cut one line from the script would weaken it. The 1950’s period is captured quietly through costumes and sets that are always present, but don’t stand out. Look around at any given moment during the picture and you’ll notice the splendid art direction, but the characters always hold the foreground. Rather than striving for nostalgic visuals, L.A. Confidential was shot using completely modern techniques, and while it was captured on color stock, the film uses shadows to achieve a classic film noir feel. The graphic violence far surpasses actual films from the Noir Era (1940’s-1950’s), feeling more like the pulp magazines from the period. In fact, such magazines even play an important role in the story, which explores how tabloids and the paparazzi were born. The soundtrack consists of original music by Jerry Goldsmith and plenty of tunes from the past, most memorably “Accentuate the Positive” during the opening credits. The “cops and corruption” genre had been done to death by 1997, but L.A. Confidential breathed new life into the material. During an especially poignant scene two-thirds into the movie, Ed Exley tells Jack Vincennes about why he became a cop in the first place. “It was supposed to be about justice ... somewhere along the way, I lost sight of that.” It’s not only a scene that turns the plot in a significant direction, but it captivates me every time I see it. Many film noirs carry a sense of unstoppable fate, like Chinatown, but the characters in L.A. Confidential are offered chances for redemption. Some are saved, most aren’t, but all play their parts in one of the most entertaining films of recent years.